Information on how to dispose of large items. Need to Dispose of a Large Item? 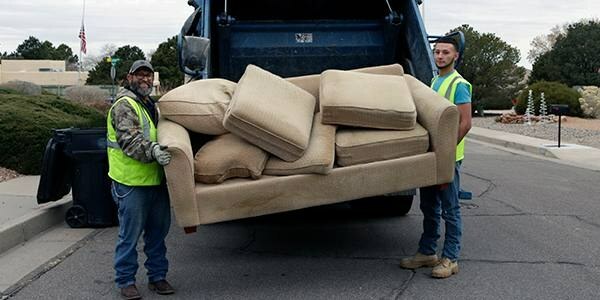 Appliances and other large items are collected throughout the year free of charge upon residential customer request. Place large items on the curb five feet away from other carts, mailboxes, fire hydrants, parked cars, low hanging trees, or utility poles so trucks can easily access. Requests must be made Monday-Saturday at least 24 hours in advance. Contaminated items will not be collected. Empty all appliances before placing them on the curb. No more than a standard pick-up load may be collected. Couch, chair, mattresses, bed frame, etc. Refrigerator, freezer, air conditioner, stove, dish washers, washing machine, dryer, etc. Appliances must be empty. Freezers/Fridges doors must be taped shut. Lawn mower, water heater, televisions, sinks, toilets, etc. Schedule a large item pick-up via the form below or call 311.